Author: Walton, Jo Set In . . .
Before Jo Walton won the Hugo and Nebula Awards for her stunning Among Others, she published a trilogy set in a dark alternate postwar England that had negotiated "Peace with Honor" with Nazi Germany in 1941. 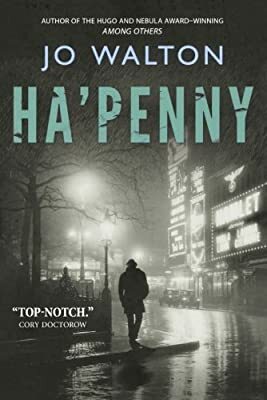 These novels-Farthing, Ha'penny, and Half a Crown-are connected by common threads, but can be read in any order. In Ha'penny, England has completed its slide into fascist dictatorship. The last hopes of democracy seem extinguished. Then a bomb explodes in a London suburb. The brilliant but compromised Inspector Carmichael of Scotland Yard is assigned the case. What he finds leads him to a conspiracy of peers and communists-of staunch King-and-Country patriots and hardened IRA gunmen-to murder the Prime Minister and his ally, Adolf Hitler. Against a background of domestic espionage and suppression, a band of idealists blackmails an actress who holds the key to the Fuhrer's death. From the ha'penny seats in the theatre to the ha'pennys that cover dead men's eyes, the conspiracy and the investigation swirl inexorably to a stunning conclusion.